LED uplighting or mood lighting is a fantastic cost effective method of transforming a venue space. Our LED uplighting (or mood lighting) is an ideal way to add a touch of colour to your venue space. We use the latest techonlogy to enable us to provide a wide range of colours to our clients. These units are also small and discreet and installed with the minimum of fuss. 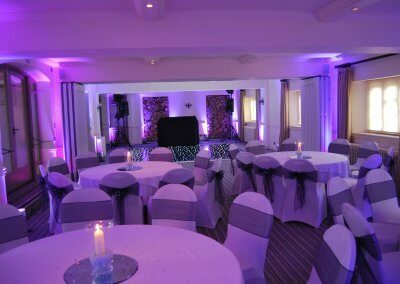 If you’re considering uplighting for your wedding then we can look at providing a colour match to your theme. We often link up our lights with the chair sashes or bridesmaid dresses. Popular colour choices for weddings have been purple, blue, pink as well as colour shades such as peach, teal & warm white. Our uplighting service looks fantastic when used with our white draping as well. This is ideal for when there’s no natural light or the inhouse lighting isn’t suitable for your needs. We cover the South & Midlands from our base in Gloucestershire. Take a look at our gallery of uplighting services we provide! If you have a plain wall or uplighting some of our plain white drapes then the colours reflected are nice and vibrant and mask many unsightly features or can highlight some aspects of the environment that you wish to make prominent. If however you have a dark setting such as wooden panels then our white LED uplighting can really help soften the feel of the venue. We have provided many different colours at various venues. The great thing about this service is that is totally down to your own personal taste (you are not even limited to just one colour).